Two bills designed to ease the sticker shock of I-66 rush-hour tolling inside the Beltway in different ways advanced in the House; their fate in the Senate is uncertain. 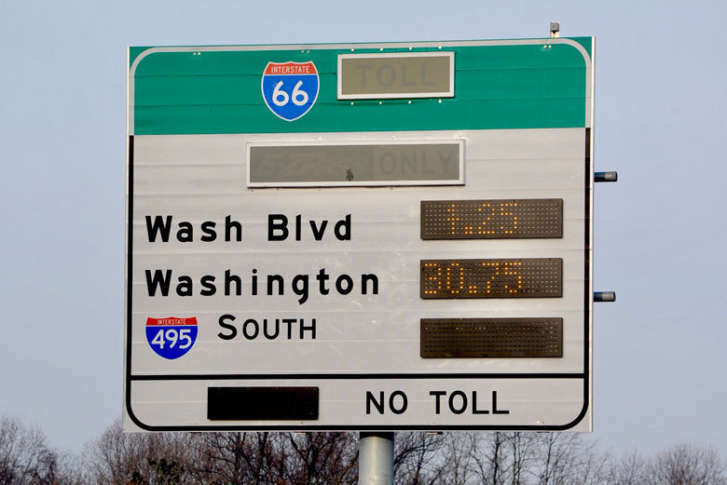 WASHINGTON — Possible changes to Interstate 66 tolls inside the Beltway were revived Thursday morning by the House Transportation Committee, even as similar measures died in the state Senate. A bill filed by Republican Del. Dave LaRock was revived Thursday after some changes to allow the current expansion of restricted hours to remain in place. The bill as amended and sent to the Appropriations Committee would now provide refunds to drivers who rack up more than $200 in tolls in a month and require the Virginia Department of Transportation to start tolling reverse-commuters by Oct. 1. The House Transportation Committee voted 21 to 1 in favor of the bill. Similar bills were killed, 7 to 6, in the Senate Transportation Committee Wednesday afternoon. The Northam administration opposes the bills, Deputy Secretary of Transportation Nick Donohue said, especially since the General Assembly approved the tolling plan inside the Beltway in 2016 along with work to add an additional eastbound lane between the Dulles Connector Road and Ballston. Providing refunds to drivers who have paid more would raise tolls for others, Donohue said, since the higher toll prices would no longer deter those drivers from entering the lanes. A separate bill, one that would ease fees on drivers with the E-ZPass Flex transponders required to ride free when meeting carpool requirements, unanimously passed the Senate Transportation Committee Wednesday and appears likely to become law. Democratic Sen. Jeremy McPike, of Prince William, said the current rule, which imposes $10 fee after failing to use the flex transponder in free mode for six consecutive months, does not help the push for carpooling. “We want behaviorally people to … have the option as they start to figure out how to slug, how to get riders — it takes time. It’s hard to invite folks into your car,” McPike said. VDOT called the bill a compromise, since it still allows them to charge the $10 fee to anyone who does not use the flex transponder in HOV mode for 12 consecutive months. Since the flex transponder costs Virginia slightly more to provide than a regular E-ZPass, the fee is meant to deter people from getting the flex if they will never use it. That bill could pass the full Senate next week. Since tolling began Dec. 4, Donohue said, traffic is moving faster on Interstate 66 in the morning and afternoon rush hour directions during the expanded hours, and delays have not increased on parallel roads such as Route 50, Route 7, Route 29 and the GW Parkway. Through Jan. 18, the average round trip toll paid by drivers is $11.15. That’s lower than some of the highest toll rates shown on signs, in part because many drivers only use a small segment of the road. “The high tolls … do not happen during the extended hours. There’s no $40 toll at 6 a.m.; the $40 is at 8:30 when if you’re a single driver before December of last year, you couldn’t legally drive on the road for the most part. The tolls in the extended hours tend to be around $3 to $4,” Donohue said. “The parallel routes provide equal travel times to the commuters that travel at 6 a.m., compared to what 66 used to do before tolling because 66 was so congested,” he added. VDOT cannot yet say for sure that more people are moving through the corridor under the tolling plan, but Donohue said speeds have increased on the highway. “The project is working,” Donohue said. If there are changes to the tolling rules inside the Beltway, Virginia could owe cash penalties to the private companies building the separate toll lanes outside the Beltway. He acknowledged there could be improvements, but said it will take more than two months of data to work out potential changes to tolling algorithms. Arlington Democratic Sen. Barbara Favola urged changes sooner to look at shorter tolling hours and a lower target speed. “VDOT should have figured out some of these barriers prior to lawmakers being asked by their constituents to put in this bill,” she said at Wednesday’s Transportation Committee hearing. A lower target speed could lower tolls, since fewer drivers would need to be deterred from the lanes, but it could also lead to less consistent traffic flow. Loudoun Democratic Sen. Jennifer Wexton called the tolling rollout a “disaster” for many of her constituents. Many of the lawmakers speaking against the tolls now supported the 2016 compromise. Fairfax Democratic Sen. Dave Marsden said he understands the sticker shock of a solo driver hitting the Dulles Greenway, then the Dulles Toll Road, then the rush-hour tolls inside the Beltway, but he believes project should get to run its course. “I think it is way too soon to question VDOT’s judgment here,” Marsden said.